AMBRA REDAELLI, 45, was born and resides in Brianza. She holds the position as CEO of Rollwasch Italiana Spa, a company established in 1950 specialized in the field of vibratory finishing. Since 1990 he has been active in Confindustria Monza and Brianza where she held various positions. In January 2010 she was appointed President of the Regional Committee of Confindustria Lombardia, covering at the same time the position of vice-president responsible for credit and Confidi. Since 2010 Ambra is part of the Central Committee of the Small Industry and of the Technical Committee for credit and finance and in May 2011 she joined the Executive Committee of Confindustria. Ambra Redaelli was advisor to the Chamber of Commerce of Monza and Brianza from its establishment in July 2007 to July 2012 and is a member of the board of Federmeccanica. Since 1992 she is active in the field of collaterals as part of Confidi Province Lombarde, where she held various positions. 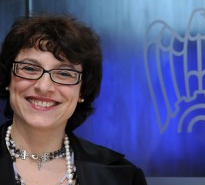 Since January 2010, she joined the Board of Directors of Federfidi and from November 2011, she is the national contact point for Confidi, within the Credit and Finance Committee of Confindustria.